Such was the case with the XRP Tip Bot, which was launched in late 2017, coinciding with the sudden burst of XRP interest and popularity in December. It first appeared when a developer on Reddit named "/u/Pepperew" - later I'd learn that it was the name of his pet bird - decided to publish a hobby project he'd been working on. To facilitate tipping, he used an application programming interface (API) to communicate with Reddit and search for any replies to his new XRP Tip Bot account, known as "/u/xrptipbot" in Reddit parlance. The syntax was easy to remember for me, and I decided to be one of the first adopters of his application. I deposited a small amount of money in my Tip Bot account. Wietse uses XRP "tags" to denote ownership, much like some of the larger exchanges. It was a risk on my part to deposit XRP with a stranger, but a small one. Although I'd never met the man, he seemed trustworthy, and after all, he'd put considerable work into constructing the application. And it used XRP: That's what I'm all about - advocating for the use of XRP. NOTE: One of the most important concepts behind how Wietse built the XRP Tip Bot is that a user doesn't need to deposit XRP. They can merely receive some tips to then turn around and start tipping others. The XRP Tip Bot will automatically create an XRP Tip Bot account for that social media account that received a tip! This was one of the concepts that resulted in its viral growth over time. In my case, I wanted to make sure I had enough XRP to cover my frequent tipping on Reddit. In case you don't know who I am, I should introduce myself; I'm a prolific writer about the XRP ecosystem, and I normally blog on the XRP Community Blog. However, I think it's important to support new, independent crypto news outlets such as the International Cryptocurrency News Network (ICNN), and I've decided to capitalize on my ICNN guest editorial to talk about XRP's most viral, community-developed application. In my opinion, XRP is currently ideal for tipping from a purely psychological standpoint, since its value is nominal compared to low-supply cryptos, and tipping anybody one zerp (the nickname for one XRP) is considered a polite way to show appreciation for their creativity, content, and communication. 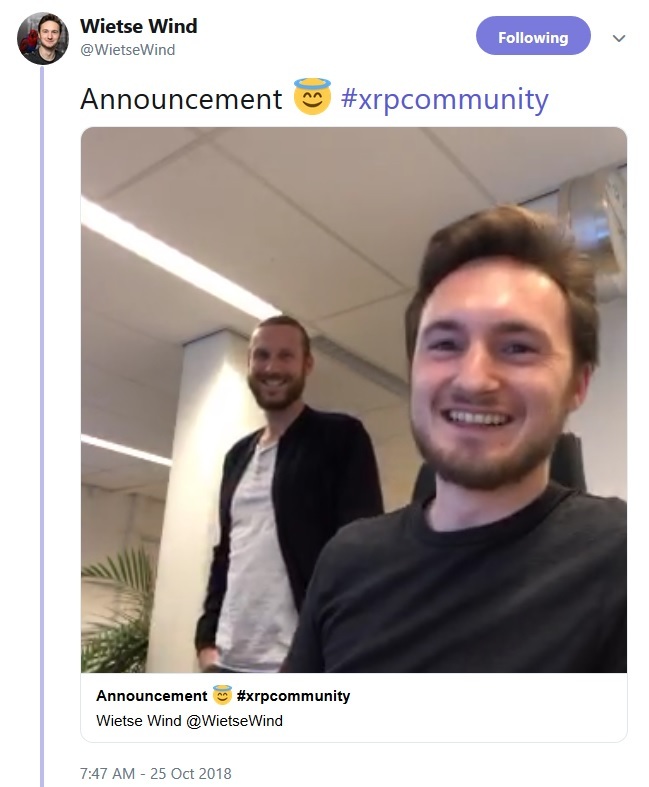 WietseWind created the tip bot using a technique of API-driven development, where he would pro-grammatically 'call' and poll a social media platform for replies using an account created for his XRP Tip Bot. In the case of Reddit, it was working perfectly and faced very little problem, as long as the use of the tip bot conformed to the sub-reddit etiquette. This success inspired him to try writing one for Twitter. Twitter proved more challenging, but Wietse persevered, enduring problems with API key-disabling, and even overcoming a complete lock-out from Twitter. When he was completely locked out from Twitter, it took collective pressure from the XRP Community to have his - and the Tip Bot's account - reinstated. And now it's hard to imagine the Twitter XRP Community operating without the XRP Tip Bot. Discord was another social media platform that uses the familiar 'scrolling reply' interface, and Wietse figured out how to run an XRP Tip Bot for that platform as well, and it works for whichever Discord server his XRP Tip Bot is a member. In all total, the XRP Tip Bot serves three social media platforms. Coil, a Silicon Valley start-up funded by Ripple's Xpring Initiative and led by Stefan Thomas, took notice of how popular the XRP Tip Bot was becoming and decided to collaborate with Wietse on integration of their new platform for web monetization. They helped Wietse create a default 'payment pointer' for each XRP Tip Bot account. This is extraordinary, because, as it stands, users do not need to 'register' to start tipping; they only need to receive a tip to start then tipping others. The only reason they'd absolutely need to log into the XRP Tip Bot website is to withdraw that XRP to their own personal wallet. So, essentially, Coil will be creating a payment pointer for any social media account that is tipped. Coil will then provide an opportunity for a content creator to use their "payment pointer," connecting it to their own website, YouTube Channel, or even Twitch stream so that when a Coil subscriber views their content, they are paid a small amount of XRP automatically through streaming payments. The Coil platform's concept is straightforward: it supports ad-free browsing, as long as the website owner acknowledges the Coil subscriber and turns off their default advertising. It was a beautiful collaboration that has worked efficiently for two months now and shows no signs of stopping. The app contains features that are convenient to use while you have a mobile device in your hand at various establishments, such as a QR code function. 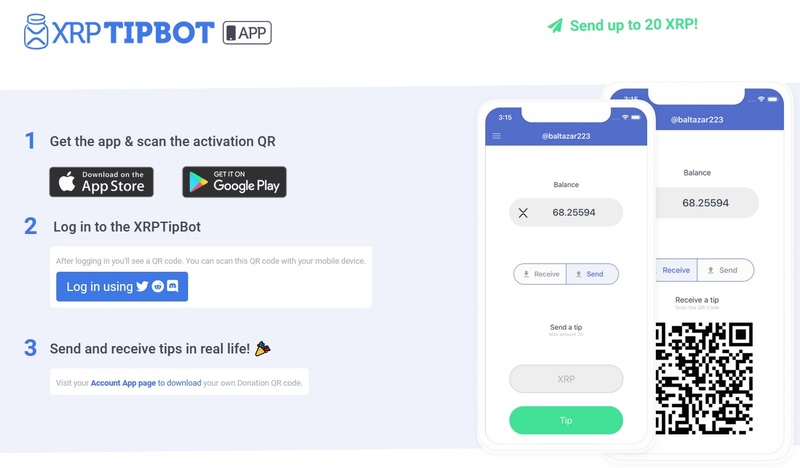 The promotion of the XRP Tip Bot to both the Google and Apple stores was a major milestone for Wietse and his growing team. ... It will take many more iterations, brainstorming, coding, designing, etc. but we firmly believe the TipBot needs to be opened to other developers, apps, platforms and frameworks, allowing people to use their TipBot balance, but also on-ledger and (with) ILP features. We're already working on another update and we hope the community will share their ideas with friends, businesses and us. One more short term goal: push notifications. Somewhere next year the TipBot will allow users to register even without their social media account ... (this will support) small businesses (using) the TipBot as well, without the social media requirement, while users with multiple social media accounts will definitely enjoy the merged balance features." I was enthusiastic to hear about the future ability for small businesses to register an account directly with the tip bot. This approach will open the door for future uses of the XRP Tip Bot besides (relatively) small tipping transactions. In addition, some nonprofits would probably jump at the chance to utilize XRP for fundraising. The group of individuals comprising the XRP Community has shown a willingness to donate their voice - and their 'zerps' - to worthy causes. Congrats to Wietse on this major step for the XRP Tip Bot, and I can't wait to hear more about its new features as time moves forward, as well as how it's being used for an even greater variety of philanthropic and business purposes. Some viral apps are like shooting stars, burning out as quickly as they first light the sky in their upward trajectory. This has not been the case for the XRP Tip Bot, however, as it continues to gain adherents, transforming into an integral tool for interim web content monetization prior to Coil's production release. In addition, Wietse indicated plans to make the XRP Tip Bot even more convenient and flexible, beyond its current capabilities. Although I've agreed to keep these plans confidential, I will say this much: it may have been XRP's first viral application, but the XRP Tip Bot is not yet done. I predict that it will expand to a multiple of its current size and become a centerpiece for Wietse's projects in 2019. ICNN would like to extend a special thank you to Hodor for his time and dedication to the XRP Community as well as making this article possible for ICNN.